Monday morning and the wind chimes are already giving me the warning, "get our there before it really starts to blow"! On my way home last night I took a look a Lowers and it was a beatiful thing. Not many people in the water for the 3-5 foot swell running. And I don't at ALL recommend taking a Stand Up Paddle Surfboard in to the line up there. Only because if the landlord shows it costs a couple hundee for your eviction notice. Not saying it hasn't been done before, just saying. A time that comes to mind is when 3 of us took a little pit stop as we paddled from San Clemente to Oceanside Harbor. Oh and another SUPS session when... oh another.... But just saying. 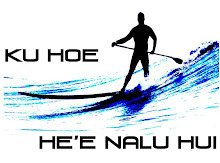 Paddle with some Aloha. Its best for all!